Sometimes it's just too much. Too much excitement, too much of a long day and too many hugs from relatives. This precious moment was captured at the Meritage Resort and Spa in Napa Valley at the end of a long day. It's these moments that as a wedding photographer we look for because they not only bring back a memory but evoke a feeling. In the image above this is young ring bearer finally says enough is enough. 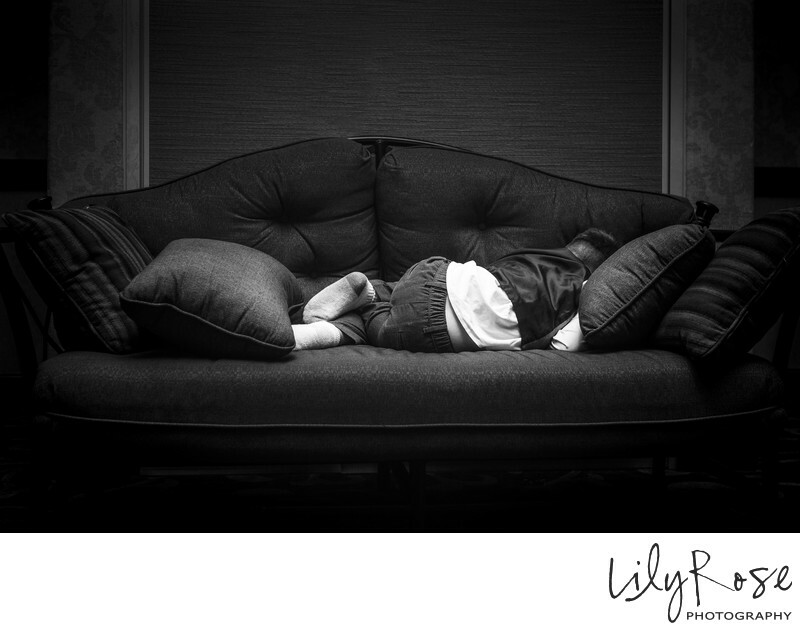 Weddings can be a very long day for a young person. For the ring-bearer, it's more than just walking down the aisle with the ring. They are involved in pictures before and after the wedding and if that's not enough there's the cake and the excitement of dancing. At 10 o'clock at night, this young person could not stay awake for anymore excitement. shown in black and white. Captured on a Canon 5D MkIII in manual mode f/4, 1/30 of a second, ISO 800. Location: 875 Bordeaux Way, Napa, California 94558.